Stephanie Koithan is worried that Republican lawmakers are going to cross a lot of things off of their abortion restriction wish list in the months ahead. Standing among more than 30 protesters in sub-freezing temperatures outside the Governor's Mansion on Friday afternoon, Koithan described her fears over the state's fetal remains burial rule and the possible consequences of further restrictions to abortion access. 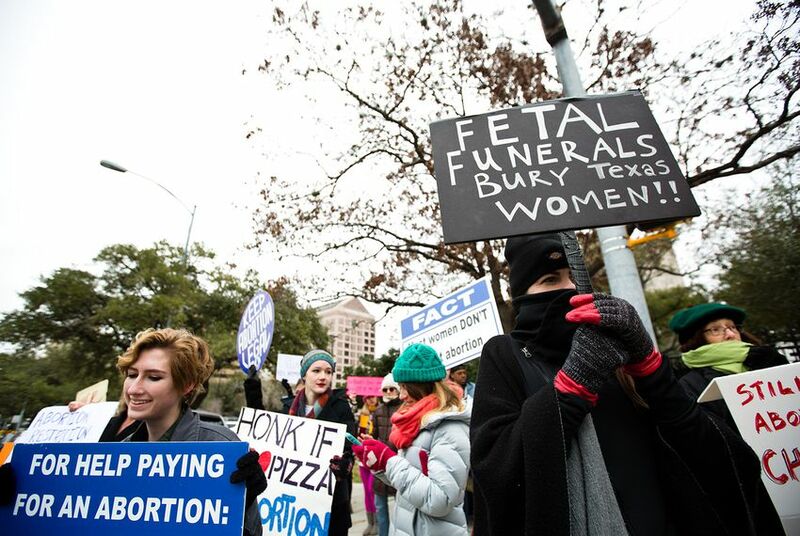 She said she organized the protest, which featured demonstrators carrying signs that read "Keep Texas women safe" and "Honk if you love pizza and abortion," to fight "for the dignity of women's lives." "I think that lawmakers all across the country are feeling emboldened on the right," Koithan said. "I think that a number of things that have been on their wish list for a long time ... they're trying to pass them through with a system that's stacked in their favor." Reproductive rights advocates have expressed concern that Lone Star State lawmakers will take bolder steps in the upcoming session to defund abortion providers and dismantle access to abortion, birth control and other sexual health services. They're also worried President-elect Donald Trump and the Republican-controlled Congress could take similar actions at the federal level, such as this week's announcement by U.S. House Speaker Paul Ryan that federal lawmakers would look at defunding Planned Parenthood. After the November election, several media outlets reported a surge of women requesting IUDs — which can protect against pregnancy for up to 10 years — for fear that birth control access will be limited and costs will increase in a Trump administration. Other reports indicated an increase in sign-ups for health insurance amid promises from elected officials to repeal the Affordable Care Act, President Obama's signature health law. Blake Rocap, legislative counsel for NARAL Pro-Choice Texas, said that while the federal government potentially taking away health insurance for millions of people is worrisome, he's not any more concerned than usual about Texas' upcoming legislative session, where abortion restriction bills are the norm. "Our goals are to not have any legislation pass that would further reduce abortion access in the state of Texas and make it any more difficult or dangerous than it already is," Rocap said. "We're going to work tooth and nail to stop those bills from becoming law." Texas legislators have already filed bills that would require burial of fetal remains, end insurance coverage for abortion and ban "dismemberment abortions," a procedure anti-abortion advocates say involves removing an unborn baby from the womb limb by limb. Texas is also fighting a pair of abortion battles in federal court. In one, a judge is slated to give a decision later this month on a fetal remains burial rule already on the books at the Texas Department of State Health Services after two days of hearings this week. In the other, Planned Parenthood of Greater Texas sued more than a year ago to block the state from kicking the women's health organization out of Medicaid, the joint federal-state health insurance program for the poor and disabled. That suit sat dormant until Dec. 20, when the Texas Health and Human Services Commission put Planned Parenthood on notice that its Medicaid funding would end. A two-day hearing is scheduled to begin Jan. 17. Sarah Wheat, a spokeswoman for Planned Parenthood of Greater Texas, said the organization is prepared for another session with the Legislature's "laser-like focus" on defunding it. "We have enormous concerns about how patients would continue to access services that they need," Wheat said. "Each time Texas has dismantled women's health programs or banned specific providers from participating, they're not able to serve all Texans that need the services. There's another tear in the safety net." Reproductive rights groups are also troubled by Senate Bill 20, filed Friday by Sen. Larry Taylor, R-Friendswood, that would deny abortion coverage under health insurance plans. The bill would allow for abortion coverage in medical emergencies but would require women would to pay extra fees for a separate add-on to their actual health insurance plan. The Legislature has introduced seven similar bills since the 2011 session, according to records from the Texas Legislative Reference Library. Lt. Gov. Dan Patrick said in a news release that SB 20 ensures "Texans are never forced to violate their conscience by paying for someone else's decision to end an innocent life." "It's imperative that we continue to fight for religious liberty, for life and for those who do not have a voice," Patrick said. "SB 20 will help us accomplish that by prohibiting certain health care plans from providing coverage for abortion other than in a medical emergency." Elizabeth Nash, state issues director for the reproductive rights advocacy organization the Guttmacher Institute, said Texas reproductive rights groups likely will be facing a new wave of restrictions after the U.S. Supreme Court's June ruling in Whole Woman's Health v. Hellerstedt, which struck down a law requiring Texas abortion providers to have minimum sizes for rooms and doorways and pipelines for anesthesia. For legislatures nationwide in 2017, popular anti-abortion bills will likely include 20-week abortion bans, fetal tissue disposal rules and dismemberment bans, Nash said. For Texas lawmakers, Nash said finding more restrictions to implement — when they already have many in place — could be difficult. "Their response to the Whole Woman's Health decision isn't to roll back restrictions; it's to double down and try to adopt more restrictions," Nash said. "It's a sort of 'we're not done' kind of feeling."